Enjoy the Forest region’s finest B&Bs for a business trip, romantic getaway, or an active weekend playing in the great outdoors. A one-of-a-kind historical home built in 1906, with the unique architecture of a flatiron building. Available for short or extended stays ranging from 1-28 days. Located within the Bradford National Historic District. Walkable distance to several restaurants, bars, and shops. With a 12-foot-high cathedral ceiling and windows on three sides, the Gail Eustace Dupont Guesthouse is spacious, and has beautiful mountain views. This modified chalet has a cozy tree house feel. You will relax the moment you walk through the door and you’ll get a great night sleep on a new king size bed. 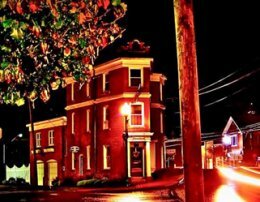 Relax and enjoy the small town atmosphere of yesteryear in the beautiful mountains of northwestern PA. The Kane Manor, a national historic landmark built by General Thomas L. Kane, awaits your arrival. 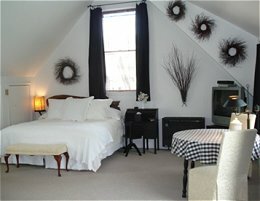 Mansion District Inn B&B Suites offers gourmet breakfasts and luxury accommodations for leisure and business travelers. 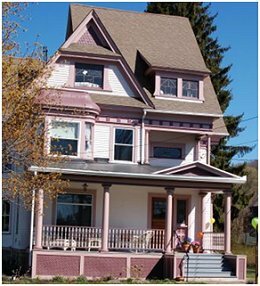 Located near Scenic Route 6, the Inn is within walking distance of Hamlin Lake, the Old Jail Museum, and is located in the heart of Smethport’s Mansion District. Only a short drive to Kinzua Sky Walk, the Allegheny National Forest, and a wide variety of four-season trails, and waterways for fishing or canoeing. Old world elegance with all the amenities – the white wicker rockers and porch swing await your arrival. You’ll appreciate Australian hospitality and a warm welcome at Oz’s Homestay on 296 Faulkner Road in Shinglehouse, Pennsylvania. 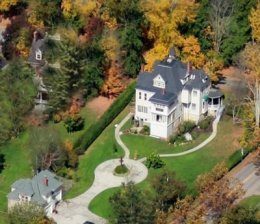 Located near the Allegheny National Forest in the beautiful Oswayo Valley, Oz’s Homestay is perfect for a romantic getaway, or an active weekend playing in the great outdoors. For over 50 years, the inn has welcomed travelers, sportsmen, hunters and businessmen with consistently great food, convivial spirits, and comfortable lodging in a friendly atmosphere. Located deep in the Allegheny National Forest, Gizmo’s is located at 108 Gizmo Drive in Wilcox, Pennsylvania. Experience one of the most remote and scenic areas in Pennsylvania. Gizmo’s offers a guest efficiency apartment with access to a beautiful dining room, where you will be treated to a delicious breakfast in the morning. Gizmo’s offers daily, weekend, weekly, and monthly rates. Find the Potter County Gasthaus on 194 Clara Road in Shinglehouse, Pennsylvania, in the heart of the Oswayo Valley. Nightly and weekly rentals are available. Five rooms will comfortably sleep up to 10 guests. Amenities include a fully equipped kitchen with open dining and living room, two full baths, washer and dryer, wireless internet and TV/DVD, and a large fireplace. Outside there is a fire pit for roasting marshmallows, a gas grill, and a wrap-around porch perfect for relaxing with family or friends. Located in Ridgway’s “Lily of the Valley” National Historic Register District, the Towers is a stunning Italianate mansion built in 1865 by lumber baron Jerome Powell. Our six beautiful guest rooms are appointed with period wallpapers and antiques and all include private baths and air conditioning. We’ll help you plan your visit, whether you are looking for rest and relaxation or searching for adventure. While the main house is adult oriented, we also have a two bedroom condo-style carriage house unit that is family-friendly. Our rates include a complete breakfast buffet with home baked goodies, and other amenities such as complimentary beverages and snacks. 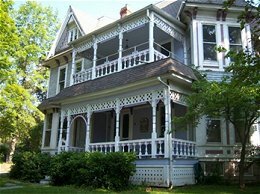 This home was originally built in 1885, and now functions as a Bed and Breakfast. There are four bedrooms with bathrooms in each room. This is also the perfect venue for any event for your family, friends, coworkers, or employees.